1931. 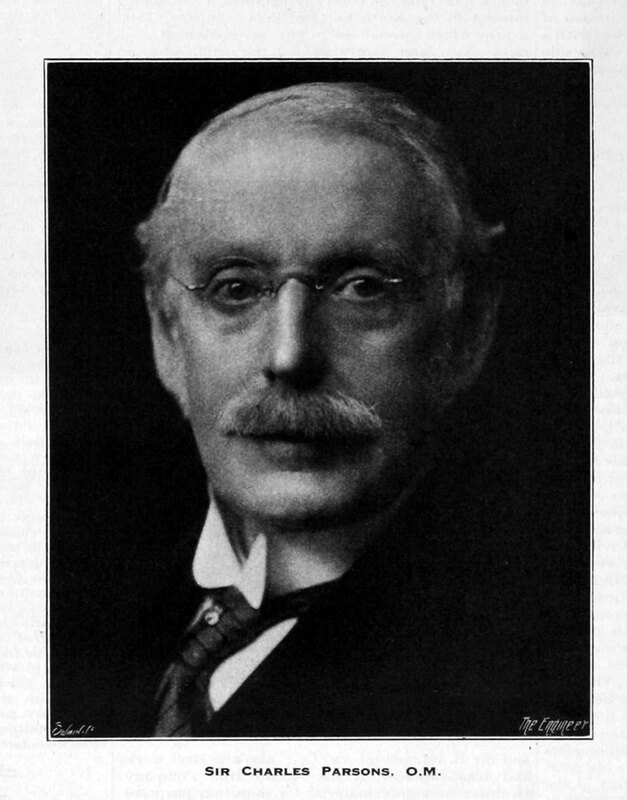 Sir Charles Parsons, O.M. 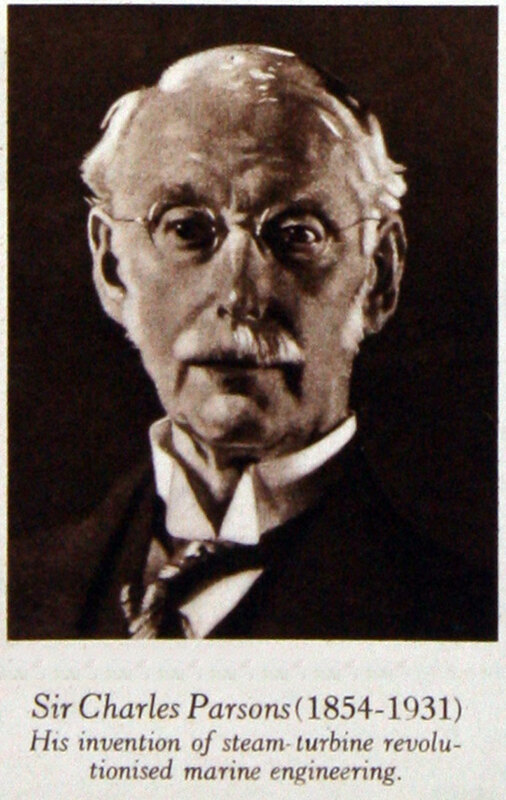 Charles Algernon Parsons (June 13, 1854 – February 11, 1931) was a British engineer, best known for his invention of the multi-stage (compounded) steam turbine. He was one of the most original British engineers since the days of James Watt and was the holder of more than 300 patents. 1854 Born at 13 Connaught Place, Hyde Park, London, he was the youngest son of the famous astronomer Lord Rosse and photographic pioneer Mary Parsons (nee Field). Educated at Trinity College, Dublin and St. John's College, Cambridge. 1877 Graduated from Cambridge in 1877 with a distinguished degree in mathematics, he then went to the Elswick works of W. G. Armstrong and Co.
1881 Leaving there in 1881 he worked with James Kitson at Leeds for 2 years. During his period at Kitsons he patented a four-cylinder high-speed epicycloidal steam engine. 1883 Married Katherine Bethell, daughter of William Bethell. 1885 His daughter Rachel Mary Parsons was born. 1887 Algernon George Parsons was born. Parsons concentrated on efforts to devise a high-speed engine for driving the newly-introduced electric generators directly and on developing a high speed generator. His steam turbine patent of 1884 was comparable in importance to that of James Watt's in 1769. 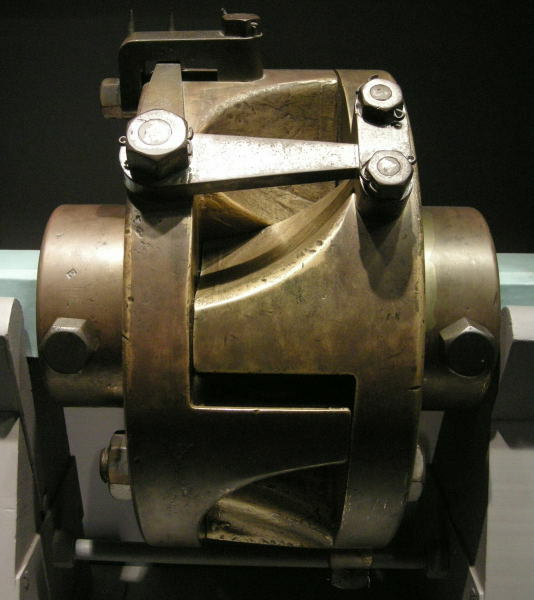 The first Parsons turbo-generator was completed in 1884 and is now preserved in the London Science Museum; by 1888 about 200 were in service, mainly for lighting on ships. 1887 Parsons, Clarke and Chapman were partners in setting up Sunbeam Lamp Co Ltd to manufacture carbon filament light bulbs. 1889 Parsons left Clarke Chapman, taking twelve employees with him, to found C. A. Parsons and Co at Heaton. 1890 The Forth Banks Power Station, the first to use a turbo-generator, started operation. An example of a 1891 radial flow steam turbine is in the London Science Museum. In 1895 Parsons sold the patent rights for U.S.A. and Canada. December 1893 he bought back the turbine patent from his partners (although the rights for Belgium, Germany, Italy and Sweden had been allowed to lapse). 1894 he applied for a patent for 'propelling a vessel by means of a steam turbine, which turbine actuates the propeller or paddle shaft directly or through gearing'. The same year he set up a separate organisation at Wallsend to focus on marine propulsion, the Marine Steam Turbine Co Ltd which built the famous turbine-powered yacht, Turbinia. This was sailed at speed through the Diamond Jubilee fleet review of the Royal Navy in June 1897 off Portsmouth, demonstrating the great potential of the new technology. 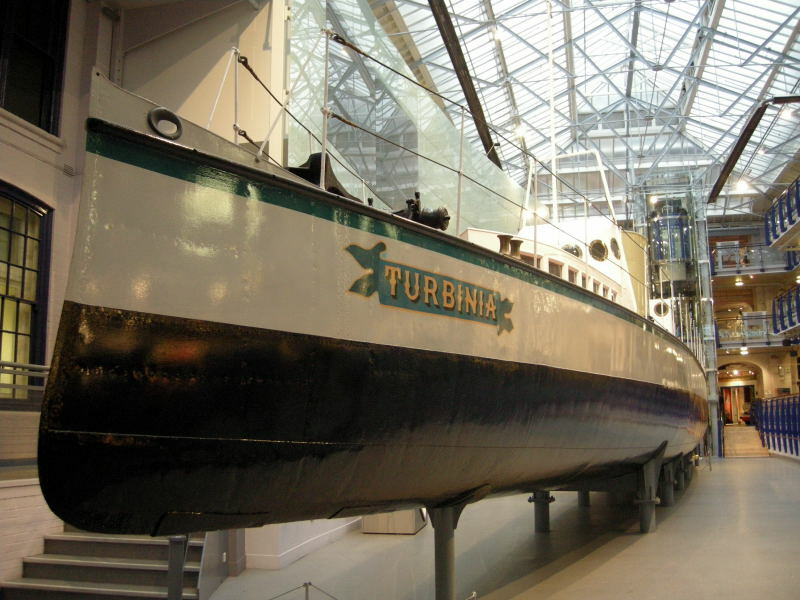 Today, Turbinia is housed in a purpose-built gallery at the Discovery Museum, Newcastle. Although Turbinia proved to be a spectacular success, its initial performance fell short of expectations. Parsons needed to establish whether the problem lay with turbine performance or with the propellers. 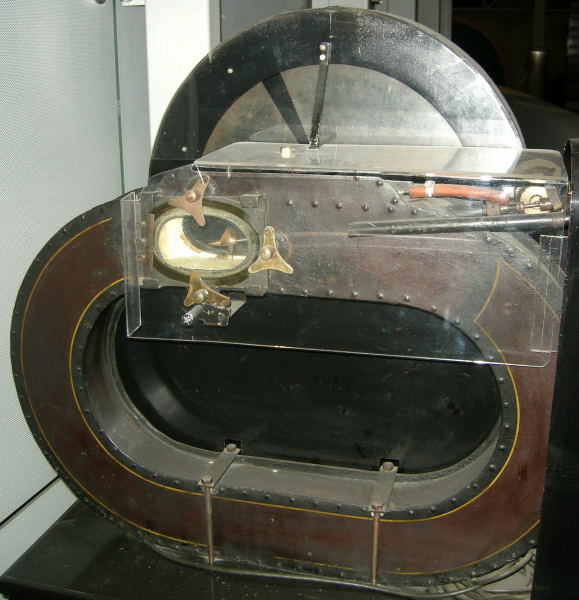 He devised an ingenious, but simple dynamometer (see photo), which proved that the problem lay with the propeller. He deduced that cavitation was occurring due to the very high speed of the propeller. Parsons credited Sir John Thornycroft and Sydney Barnaby with first observing the phenomenon . He set about investigating the problem using a small scale chamber in which model propellers could be tested (see photo). Because of the small size of the models, the tests had to be done at sub-atmospheric pressure to provoke cavitation at reasonable shaft speeds. The cure was to use very wide blades, and, on Turbinia, to have three shafts each with three propellers. Each shaft was driven by its own turbine. Each turbine was part of the a cross-compound set comprising High, Intermediate and Low Pressure turbines. When the success of Turbinia had been established, Parsons set up a new company in Newcastle Upon Tyne, the Parsons Marine Steam Turbine Co, which bought the rights from Marine Steam Turbine Co Ltd. In 1898 Charles Parsons went to court seeking to extend the life of the turbine patent; a 5-year extension was granted. 1897 His cousin, Geoffrey, joined the Marine Steam Turbine Co; he became a director of Parsons Marine Steam Turbine Co in 1911. 1900 Brown, Boveri and Co and The Parsons Foreign Patents Co entered into a contract for the sale and manufacture of the well-known Parsons' steam turbine in the following countries: France, Germany, Russia, Switzerland and Italy. As well as working on dynamo and turbine design, and power generation, which exerted great influence on the fields of naval and electrical engineering, Charles Parsons also initiated developments such as geared turbines for use with low-speed vessels (1909) and high-pressure steam engines (after WW1). Parsons was also interested in acoustics and in optics. He organized a special department for the production of searchlight reflectors at Heaton. 1921 he acquired a controlling interest in the optical firm of Ross Ltd, of Clapham, where he improved the methods of glass-grinding. He also purchased the Derby Crown Glass Co to improve the basic glass. The Parsons Optical Glass Company produced many different types of glass for optical purposes. 1925 he purchased the firm of Sir Howard Grubb and Sons, makers of large astronomical telescopes. The re-named company, Grubb Parsons, had works at Walkergate, adjacent to the turbine works, where many large telescopes were produced. In 1937 Savage and Parsons was set up to produce searchlights and acoustic detectors. He established traditions of "reliability, efficiency and service" in electricity generation, which were maintained by C. A. Parsons and Co.
His company survives in the Heaton area of Newcastle and is now part of Siemens, a German conglomerate. Sometimes referred to as Siemens Parsons, the company recently completed a major redevelopment programme, reducing the size of its site by around three quarters and installing the latest manufacturing technology. The Parsons Building in Trinity College, Dublin, which houses the Department of Mechanical and Manufacturing Engineering, is named in his honour. On 28 September 2006, the Minister for Communications, Marine and Natural Resources, Mr Noel Dempsey TD, announced the Charles Parsons Awards which provide funding for research groups engaged in energy research in Ireland. The Hon. Sir CHARLES ALGERNON PARSONS, O.M., K.C.B., LL.D., D.Sc., became a Graduate of the Institution in 1880, and was first elected a Member in 1882. In 1925 he was elected an Honorary Life Member in view of his eminent scientific attainments, and the Institution thus recognized the greatness of one of its Members, of whom the President said, in referring at the Annual General Meeting on 20th February to his death, his name "would hold in the pages of history a place of equal fame and honour with those of Savery, Newcomen, Watt, Trevithick, and Stephenson." In including in the "Proceedings" a brief memoir of every deceased member of the Institution of whose professional career particulars are obtainable, it is rare that the space available is adequate to do justice to the work of those who are gone from us, and in such a case as this the mere recital of the firms and work with which the deceased Member was connected, which is all that is usually possible, would be not merely inadequate, but almost irrelevant. Neither would such a recital in this case be an inspiration to young members who are still at the humble beginnings of their careers, in the sense in which it is perhaps usually its best justification, for Sir Charles enjoyed advantages in his early years which are given to few. The youngest son of the third Earl of Rosse, his father, with all the resources of his aristocracy of mind as well as of worldly position, trained him, almost from his birth in 1854, to be an engineer and scientist. A private workshop was his constant resort in boyhood, and he had as tutors such distinguished men as Sir Robert Ball and Dr. Johnstone Stoney. Yet this does not in the least dim the lustre of Sir Charles's subsequent achievements, for rarely can such good fortune have come to one so fitted to turn it to greatest advantage. He went to Cambridge University, where he was placed eleventh wrangler, and was then apprenticed at Armstrong's Elswick works. At this time Sir Charles was experimenting with rotary steam-engines in which the cylinders rotated round a revolving crank-shaft at half the speed of the latter. Several such engines were built while he was at Armstrong's, and later at Kitson's of Leeds, where for a time he held an appointment. He first began to make practical experiments with the steam-turbine at Messrs. Clarke, Chapman, Parsons and Company's, of Gateshead, of which firm he had become junior partner, and in 1884 were filed two patents which represented the commencement of the development of the modern steam-turbine. One of these was concerned with the dynamo which the turbine was to drive, for it was largely upon the achievement of constructing such a machine to run at a speed of 18,000 r.p.m. that the success of this initial turbine depended. Less than a year after, the first unit of 4 kw. was built, and this was the machine now in the Science Museum at South Kensington. Many more machines, representing constant improvement, were built, until in 1889 the partnership was dissolved. The firm of C. A. Parsons and Company was then founded, and during the following five years was engaged in evolving an alternative type of turbine using the principle of radial flow. In 1894, however, the original patent rights were restored to Sir Charles, and subsequent progress towards the present triumph of the steam-turbine was rapid. It was in the same year, 1894, that the Parsons Marine Steam Turbine Company was formed, with Sir Charles as managing director, and shortly afterwards the famous "Turbinia" appeared. In recent years Sir Charles was still interested in pioneer work, notably in the high-pressure experimental Clyde steamer "King George V," and his genius extended to optical work and experiments in physical science. He took over the Derby Crown Glass Works for the construction of searchlights and mirrors, and later founded, in conjunction with Sir Howard Grubb, a company to manufacture astronomical instruments and telescopes. His physical experiments were chiefly concerned with attempts to crystallize carbon under high pressure. Sir Charles was elected a Fellow of the Royal Society in 1898, and he received the great honour of the Order of Merit in 1927. In 1928 he was the first engineer to win the Copley Medal. He was a Member of the Institution of Civil Engineers and an Honorary Member of the Institution of Electrical Engineers, while in 1917 he was President of the British Association. In 1926 he was awarded the Kelvin Medal. Sir Charles Parsons died on 11th February 1931 while on a cruise at sea. THE HON. SIR CHARLES ALGERNON PARSONS, O.M., K.C.B., F.R.S., youngest son of the distinguished astronomer William Parsons, third Earl of Rosse, was born in London on the 13th June, 1854. He spent his boyhood at the family seat, Birr Castle, Parsonstown, Ireland, where the workshops in which his father constructed the great telescope afforded him practical education in mechanical things, while his theoretical studies were pursued under tutors, among whom was Sir Robert Ball. At the age of 18 he went to Trinity College, Dublin, and a year later he entered St. John’s College, Cambridge, and became a pupil of Dr. Routh. In 1877 he passed out as eleventh wrangler and went into the works of Sir W. G. Armstrong, Mitchell and Company at Elswick. After serving 4 years’ apprenticeship at Elswick he was employed for 2 years on experimental work at the Airedale foundry of Messrs. Kitson and Company at Leeds, a firm which his elder brother Clere (the late R. C. Parsons, M. Inst. C.E.) had already joined. During that time he developed an epicycloidal engine and a method of propelling torpedoes by means of rockets. He tried his torpedoes in Roundhay lake, but although fair success was achieved, the rockets proved to be unsafe. In 1884 he joined as junior partner the firm of Clarke, Chapman and Company, of Gateshead-on-Tyne, who were interested in the development of electric lighting, and devoted his attention to the production of a steam turbine suitable for driving dynamos, his first patents being dated 23rd April, 1884. During the ensuing 5 years the combined steam turbine and dynamo was developed, but mainly for the lighting of ships and on a small scale. Further progress called for costly experiments, justified in his own view by a belief in the future of the steam turbine which others did not fully share. He therefore decided to set up his own works at Heaton in Newcastle-on-Tyne. His struggles during the first 5 years of this venture were enhanced by questions of ownership of his original patents, which obliged him for a time to confine his developments to the radial-flow type of turbine, and in the first practical installation, at the Cambridge electric-supply station in 1891, the turbine was of that type ; but in 1894 he recovered possession of his early patents and could revert to his original parallel-flow type. The value of his invention and the smallness of the reward which he had received when his fundamental patent expired enabled him to secure an extension of 6 years for that patent. The successful production of a high-speed rotary engine involved innumerable mechanical problems calling for the highest ingenuity and resource. 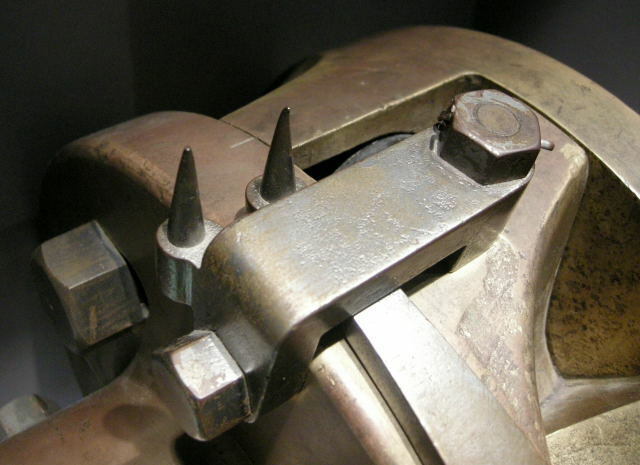 "Throughout the whole evolution of the steam turbine he continued to be the active and incessant deus ex machina. Other inventors appeared and made their contributions, which led in some cases to more or less different designs. But they would be the first to acknowledge that it is to Parsons, far more than to any other man, that credit is due, not only for the first conception and the initial experiments, but for the subsequent improvements which have produced the gigantic turbines of to-day and have made them the chief means of generating central-station power and of propelling the biggest ships. All large modern turbines adopt his fundamental plan of multi-compound action by dividing the whole drop of pressure into many successive stages." Meanwhile Parsons had turned his attention to the application of the steam turbine to ship-propulsion, and in 1894 he built the "Turbinia," 100 feet long and of 9 feet beam, fitted with a radial flow turbine and a single shaft, for which he substituted later three shafts, each driven by a turbine. This little vessel was shown at the Diamond Jubilee Naval Review in 1897, when her speed astonished the Fleet. 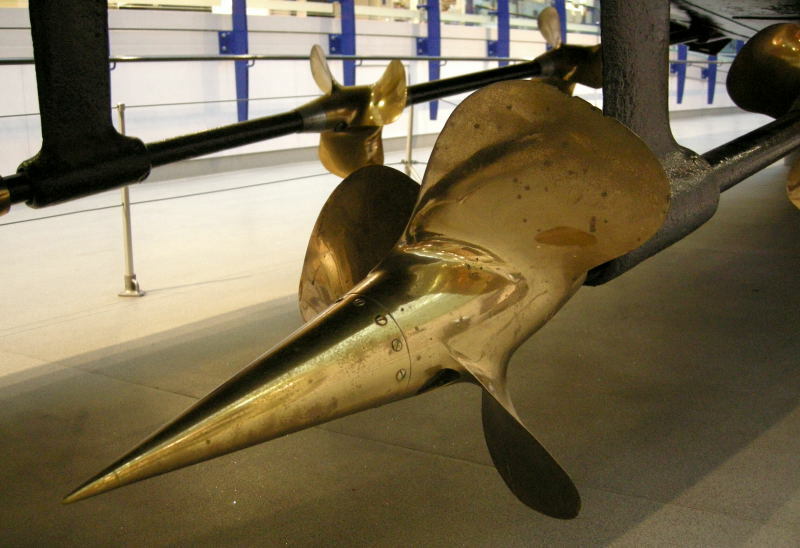 With high speed of rotation of the propellers, cavitation became a serious problem, and Parsons undertook an experimental investigation of it, the results of which enabled him to design successfully directly-coupled turbines and propellers. The Admiralty, after trying turbines in destroyers and in the "Amethyst," adopted them in 1905 for the "Dreadnought," and later ships, and other navies followed this lead. The first mercantile turbine-driven vessel was the Clyde steamer "King Edward"; other vessels, including Atlantic liners, followed; and in 1904 the bold step was taken of adopting turbines of 70,000 shaft HP. for the propulsion of the Cunard liners "Lusitania" and "Mauretania" with entirely successful results. Parsons realized, however, that the direct coupling of engine and propeller limited the possibilities of the turbine, and he therefore set to work to devise a suitable form of mechanical gearing. In 1909 the Parsons Marine Steam Turbine Company, which had taken over the marine side of the business, bought the cargo-steamer "Vespasian" and replaced her triple-expansion engines by turbines fitted with gearing giving a speed reduction of 20 to 1 ; and with the successful outcome of this experiment direct coupling became a thing of the past. Here again the mechanical problems of producing satisfactory gear wheels gave scope for his ingenuity and resource, and were solved so successfully that in H.M.S. "Hood" 144,000 HP. is transmitted through a single-reduction gear; and the transmission of 175,000 HP. by such gearing is contemplated in the Cunard vessel now (1931) under construction. While these marine developments were taking place, the steam turbine had become the chief prime mover in electric power-stations and the output of the turbo-alternator has gradually increased until machines of 80,000 kilowatts and more are in use. In a Parsons turbine installed in Chicago in 1923 a steam-pressure of 550 lbs. per square inch and a temperature of 760 F. was adopted, and Parsons demonstrated the applicability of high steam-pressures and high superheat to marine purposes in the Clyde river steamer "King George V," in 1926. Other fields in which his inventive skill was applied were the manufacture of parabolic reflectors for searchlights and the production of optical glass of high quality. He devised means of producing at moderate cost reflectors of high efficiency and great accuracy of parabolic form ; and his interest in optical glass led him to acquire the Derby Crown Glass Works and to form the Parsons Optical Glass Company. In partnership with Sir Howard Grubb and Company he established at Heaton a workshop for building telescopes of any size. One problem, however, to which he devoted much time and money, bested him, namely, the production of diamonds by the artificial crystallization of carbon. In spite of the highly ingenious methods by which he pursued the subject, he had achieved no result at the time of his death. Many other scientific problems and interests filled his life, from the construction of amusing mechanical toys in his boyhood to the question of the feasibility and advantage of sinking a bore-hole 12 miles deep to examine the earth's crust, a subject which he discussed in his Presidential Address to Section G of the British Association in 1904. His inventiveness is indicated by the fact that he took out more than 300 British patents. Innumerable honours were conferred upon him in recognition of his achievements. He was made C.B. in 1904 and K.C.B. in 1911, and received the Order of Merit in 1927. He was a Vice-President of the Royal Society, to which he was elected in 1898. That Society awarded him the Rumford and Copley Medals, and from other societies he received the Albert, Kelvin, Faraday, Franklin, and Bessemer Medals. 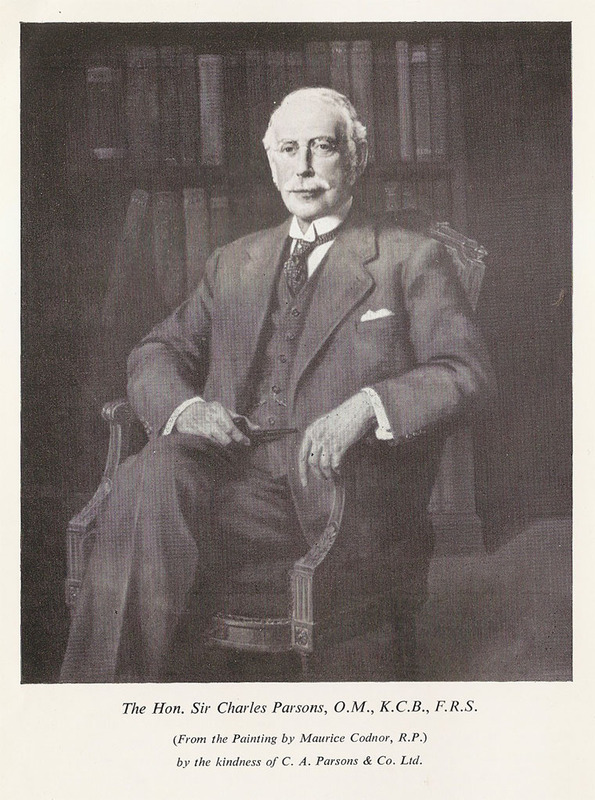 The universities of Cambridge, Oxford, Edinburgh, Glasgow, Dublin, Durham, Leeds, Liverpool, Toronto and Pennsylvania conferred honorary degrees upon him, and he was President of the British Association (1919), the Institute of Physics, and the North-East Coast Institution of Engineers and Shipbuilders. He was a generous donor to the funds of the British Association, the Royal Institution, the Royal Society, and other bodies, and served as a member of the Advisory Council of the Department of Scientific and Industrial Research. Sir Charles was elected into the Institution as an Associate Member in 1881, transferred to Membership in 1892, and elected as a Member of Council in 1903. He served on that body until 1907, and again from 1909 to 1913. He contributed a Paper to the Proceedings (jointly with Dr. G. G. Stoney)l and two introductory notes at the Engineering Conference of 1897. He was the author of numerous Papers presented to the Royal Society, the Institution of Naval Architects, the Institution of Electrical Engineers, and other bodies, and in 1918 delivered the Bakerian lecture of the Royal Society. He married in 1884 Katharine, daughter of Mr. W. F. Bethell, of Rise Park, East Yorkshire, by whom he had one son (Major A. G. Parsons, R.F.A., killed in action in 1918) and one daughter, who, with Lady Parsons, survives him. His character and personality are perhaps best described in the words of Lady Parsons and of his friend Sir Alfred Ewing. Charles had the character of being an extraordinary and weird young man socially, but it was understood he was a great genius. . . He was immensely keen about the torpedo, and used to take the mechanic and me to Roundhay Lake at 7 a.m. . . . There they spent hours trying the torpedo, while I shivered on the bank. Parsons used in after life to say that he had missed much through not being sent to school. He did, undoubtedly, miss something. Shy, self-contained, inexpressive, he never wholly shook off certain characteristics which a public school might have masked or cured. To the last, even in the universal celebrity of his riper years, he kept an air of self-effacement, an exaggerated though wholly natural modesty which puzzled strangers as much as it endeared him to his friends. He died at sea, after a brief illness, on the 11th February, 1931. The Hon. 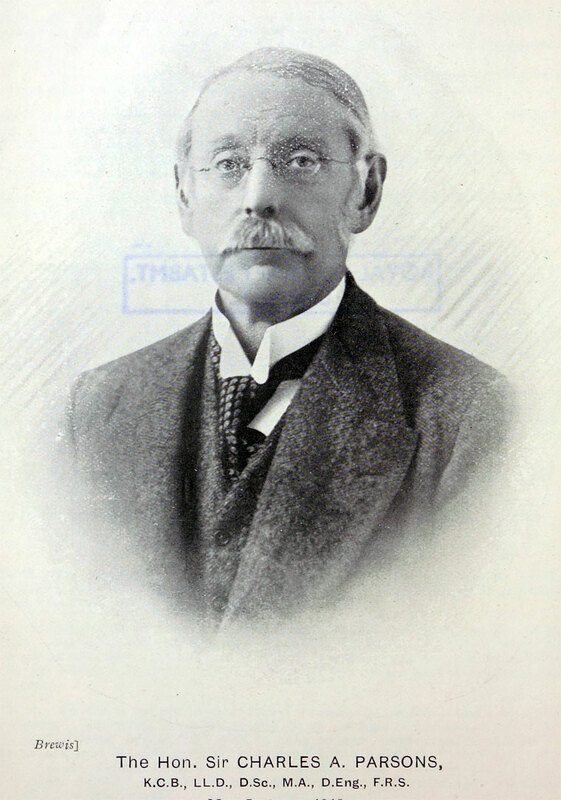 Sir CHARLES PARSONS, K.C.B., 0.M., LL.D.,D.Sc., F.R.S., a former Member of Council, and Original Member of the Institute, died on February 12, 1931, when on a voyage to the West Indies. At a memorial service held in Westminster Abbey on March 3, the Institute was represented by the President, Dr. Richard Seligman. The name of Sir Charles Parsons has been for nearly half a century a household one throughout the world. Whether interested in science or not, all will regret the passing of a genius who spent a strenuous life in doing invaluable service to mankind. Sir Charles Parsons, who was born on June 13, 1854, had the great good fortune of the guidance of a father eminent in the scientific world—the third Earl of Rosso, of telescope fame, whose home must have been an ideal nursery for a budding engineer. At the age of twelve the boy Charles, assisted by his brothers, built a steam carriage of 4 H.P. with a speed of 10 miles per hour. At Cambridge, where, at St. John's, he took a three years course, and came out as eleventh wrangler, he interested himself in his great hobby of machine construction, building many models of steam engines. After leaving Cambridge, at the age of twenty-two, he was apprenticed at the great Elswick engineering works of Armstrong's, where his attention was largely centred on rotary steam engine design, the perfection of which he continued to work out when with Kitson & Company of Leeds, and, afterwards, as a partner with Clarke, Chapman, Parsons & Company, Ltd., of Gateshead. His efforts here resulted in improving what had been attempted by others in the use of steam turbines. In 1884 Sir Charles patented his own invention, and the practical employment of the modern steam turbine was thus established. In 1890 he founded, under the title of C. A. Parsons & Company, Ltd., the renowned Heaton Works at Newcastle-upon-Tyne. From 1890 until his death he was indefatigable in adapting his turbines to a variety of world- wide uses. The extent of the universal debt owing to the activities of Sir 'Charles Parsons must ever remain beyond measure; those who are engaged in seafaring and the supply of electric power can best judge. "THE LATE HON. SIR C. A. PARSONS. his early education privately and at St. John’s College, Cambridge. His whole life was a contribution to science, his researches extending, as has been well said, from microscopic particles to huge Atlantic liners, and he was actively engaged on researches into many widely differing problems up to the time of his death. Sir Charles must be classed as an experimenter of the first order rather than as an inventor, great as were his achievements in the latter role; it is another case of the means being essential to the end. It is true he set out in his work of research with a fixed intention of reaching a definite end, at least in respect of the turbine, but his mechanical genius was disclosed as much in his experimental methods as in his final invention. Fortuitous circumstances or fortunate discovery were never his lot. He had to work hard to attain his objective, and his ingenuity in devising apparatus was as effective in this procedure as his great and broad knowledge of science. achievement, and many were induced to visit it, not only because of the charm and scientific knowledge of the host, but because of his wonderful celestial telescope, then the largest in the world. Moreover, Sir Charles, with his brothers, had a succession of distinguished tutors, namely, Dr. Stoney, his brother—Bindon Stoney, the Rev. T. Gray, later a distinguished Senior Fellow of Trinity College, Professor Purser, afterwards Professor of Mathematics at Belfast, and Sir Robert Ball, later the Astronomer-Royal, while Sir Charles, in after life, declared that he had learned from his father the first principles of mechanical construction in engineering, since his lordship was a skilled engineer as well as a scientist and astronomer. Although not yet past his thirteenth year when Ball was at Birr Castle, Sir Robert gives a clear proof that “ the child was father to the man ” in the case of the future inventor of the steam turbine. Sir Robert writes in his “ Reminiscences,” that the small workshop at Birr Castle was “ the constant' resort of my youngest pupil, the Hon. Charles Parsons. In this little den he was always making all sorts of machines. I remember two of his early contrivances. One of them was an air cane and the other a sounding machine, which he afterwards used with success in his father’s yacht Titania. In later years, Sir Charles was wont to regret that he hadnot the advantage of a public school education. Without disparaging for a moment the influence on character derived from such a training, we prefer to accept the undoubtedly superior qualities, so far as mechanics are concerned, of the foundation laid by the unique environment and training at Birr; we even question whether there might not have been some hindrance to the development of innate or hereditary qualities during a public school regime. Suffice it to say that when, after a short period at Dublin University, Sir Charles entered St. John’s College, Cambridge, at the age of nineteen, there were none of his compeers better able to assimilate the teaching of the class room or the influence of university life or of sport, notably, boating, winning his college “ pairs ” and rowing in the first boat of his college, then fifth on the river. His three years’ course terminated with the winning of high honours as eleventh wrangler. At the age of twenty-two he became pupil apprentice at Armstrong’s works at Elswick, where he continued for four years. Later in life Parsons acknowledged his great indebtedness to the example of Sir William (afterwards Lord) Armstrong. He said that he had been immensely impressed by his mechanical genius, the lay-out of his experiments, his remarkable powers of mechanical diagnosis, and his extraordinary attention to minute details in critical cases of difficulty. Indeed, these qualities were faithfully reproduced in Sir Charles himself throughout his engineering career, a fact which once more establishes the ascendancy of personal example to youth. Even when an apprentice Parsons gave scope to his inventive ingenuity, his most notable successes being valve motions and the four-cylinder epicycloidal rotary engine with revolving cylinders, which were then manufactured by Messrs. Kitson of Leeds, and of which he had made models when at Cambridge. This engine differed from all those of the period, for not only did the crankshaft revolve, but the cylinders rotated round it, making half as many revolutions as the shaft. * It followed naturally that, with the termination of his apprenticeship, Parsons should join Messrs. Kitson in the capacity of experimentalist, and there he continued two years, until 1883, his chief work being on the propulsion of torpedoes by rockets. The flame acting upon “ spinners,” the water filling the spiral chambers being ejected by the gaseous pressure. The epicycloidal engine and its limitations stimulated thought on the steam turbine. The records of thermodynamics are strewn with failures, mechanical and otherwise, of efforts to solve the problems of the steam turbine. Notwithstanding these, perhaps because of these, Parsons scrupulously refrained from making any study of patents ; they might have proved disheartening; they might have made it more difficult to adopt an entirely new angle of view, which was most essential to success. He approaohed the problem from the analogy of the water turbine. His guiding hypothesis was sound. He assumed that by splitting up the fall in pressure over a great number of steam turbines the action in each would approximate to that in a turbine using an incompressible fluid, such as water, and that the aggregate of these simple turbines, which together would constitute his complete machine, would give the required efficiency, approximating to that obtained in water turbines. The mechanical difficulties were great, due in part to the necessity for a bucket speed equal to a large fraction of the velocity of the steam—a bucket speed of something like 220 ft. per second. It was here that great ingenuity and perseverance in experiment were essential. The first Parsons steam turbine was completed in 1884. It was a 4 kw. machine comprising a series of rotating wheels, each complete in itself and corresponding to a parallel flow water turbine, the blades being milled out of the. solid on the periphery of brass rings, a construction subsequently superseded by one more perfect, in which the blades were set, and wedged with distance pieces in rings, with their roots in grooves on the drum and on the casing, as is now familiar to all. At that time little was known as to the theory of the dynamo. It was not until two years later that the late Professor John Hopkinson, F.R.S., put the theory on a firm basis; so that the invention of the high-speed dynamo, with the knowledge then available, to run at 18,000 r.p.m., was as great an invention almost as the steam turbine itself. The mechanical difficulties met with were certainly as great, but they were overcome, and although the steam consumption of this first turbine was about 200 lb. per kilowatt hour, the pressure being only 60 lb. per square inch, the mechanical potentiality of the invention was at once recognised, one of the most convinced of physicists being Lord Kelvin himself. The early machines were made by Messrs. Clark, Chapman, Parsons and Co., Sir Charles having become a partner when he left Messrs. Kitson. He continued thus for six years, and a number of turbines of small size for running eleotric dynamos were constructed, the largest being of only 100 h.p. The dissolution of partnership deprived Parsons of his patent rights. He, however, established works at Heaton, and there, as well as at his laboratory at home, continued for five years a series of experiments in order to produce a radial flow turbine, although recognising that his original invention, based on a parallel flow system, was preferable. In spite of this his experiments culminated in 1892 by the construction of a radial flow turbine of 100 kw. output, adapted for condensing, which when tested by Sir Alfred Ewing, consumed only 27 lb. of steam per kilowatt hour, and machines of the same type were supplied to the Newcastle, Cambridge and Scarborough electric stations. Several important improvements in detail, not only in turbine design, but in the electrical machine, were made, so that when the patent rights were recovered in 1894 (for a small fraction of the price originally offered to Messrs Clark, Chapman) a great advance became possible. It is interesting in this connection, however, to record that immediately preceding the recovery of his own patents, he had embarked on a line of experiment which " must inevitably have resulted in the commercial success of the impulse principle, since introduced in other turbines; but his attention was deflected a to the development of his original reaction parallel flow system. One of the notable characteristics of Sir Charles Parsons was his dogged determination to make a success of anything he took in hand, and never to allow himself to be discouraged by any .setback, however great. And set-backs were numerous, especially in the early days of the steam turbine, which might well have disheartened a less courageous man. When I joined him in 1888, he was a partner in Messrs. Clarke, Chapman, Parsons and Company, Limited, at Gateshead, and the largest turbine made was of 32 kw. and non-condensing. It was shortly afterwards, on account of the non-progressive policy of his co-directors and their want of belief in the future of the steam turbine, that he decided to part company from them and start the Heaton Works, Newcastle-on-Tyne, on his own account. And here he met with the serious set-back, in that his former partners refused to give up his patents, except at an inordinate price. This resulted in an arbitration case, by which he lost his original patents, both on the turbine and the electrical side. Not discouraged, he set to work to develop a turbine and high-speed dynamo outside the original patents, in which the steam flow was radial instead of parallel to the axis. The first, in which the steam flowed inwards in a series of wheels, was a-complete failure, as the water in the saturated steam was thrown outwards and cut away the guide; blades in a few minutes. The obvious thing was to reverse the flow and to make the steam flow outwards, and thus a turbine was constructed consisting of a series of wheels, the first made having one row of reaction blades and subsequent designs from three to five rows on each wheel. Many of these were made, chiefly 16 kw. and 32 kw., non-condensing. They ran all right, but the steam consumption was very high, chiefly owing to windage, about which little was known at the time. Other types were also -tried about this period, such as a single disc bladed on one or both sides, and also a number of Hero wheels in series, but these were all more or less failures owing to excessive steam consumption. It was evident, however, that, with increased size and the adoption of condensing, better results could be obtained, and an experimental turbine of 100 kw. at 4,800 r.p.m. was made. With this, when tested by Professor (now Sir) John Ewing, F.R.S., the reoord consumption of 27 lb.’ per kilowatt-hour was obtained, with 100 lb. per square inch gauge stop-valve pressure, 60 deg; F. superheat, and 27-in. vacuum. This led the way to similar but somewhat larger turbines being adopted for the Cambridge, Scarborough, and other stations. By 1894, the firm he had been formerly connected with found they could do nothing with the original patents and could not make a success of the steam turbine. As a result, Sir Charles got back his patents for some 2,000Z. instead of the huge sum of about 98.000Z. originally asked for them. After five most strenuous and difficult years, the parallel-flow turbine was reverted to, and this is the type of reaction turbine in use to this day with little change in the essentials, although great improvements have been made in detail. Many other difficulties were met with from time to time, but all were overcome by Sir Charles’ great meohanical instinct and practical and theoretical knowledge enabling him to see what it was best to do in order to deal with the various difficulties encountered. An example of this is how he got over the trouble with cavitation in the Turbinia, as described in our obituary notioe, on page 205, ante. The Turbinia also was a remarkable example of Sir , Charles’ power to obtain accurate results from the most primitive apparatus, although when necessary he did .not hesitate to get the most expensive and elaborate apparatus possible. Models of various hulls for the Turbinia were made, at first 2 ft. long and afterwards 6 ft. long, and these were tested in the condenser pond at Heaton Works by simply towing them by a string over a pulley. Various propellers were also tried in these models, driven by india-rubber cords twisted until they became knotted, and thus giving an approximately constant torque. By such primitive apparatus he obtained results agreeing within 1 per cent, with tests made long afterwards at the National Physical Laboratory on the same models. Of course, such tests gave no clue to the cavitatibn trouble, which later caused three shafts and nine propellers to be substituted for the single shaft. All through the history .of the steam turbine Sir Charles was remarkable for the courage with which he advocated new and larger designs. More, people have come to grief in going from a small to a large machine than in anything else, but he, with his great foresight and mechanical instinct, combined with his theoretical and practical knowledge, successfully avoided the pitfalls into which so many have fallen. Thus, the steam turbine on land went successfully from 4 kw. in 1884 to 32 kw. in 1888, and to 1,000 kw, in 1900, and now his-firm have made and have in hand some of 50,000 .kw. ; there is now no difficulty in making turbines of four times or more this capacity. On the marine side also, the development was most rapid, and the step from the 8,000 shaft horse-power of the cross-channel boat Queen, which was the largest of which experience had been obtained at the time the Mauretania was designed, to the 68,000 shaft horse-power of the latter, required the greatest courage on the part of Sir Charles, and was an example of the faith which the Cunard Company, the Admiralty, and the Wallsend Slipway Company, who, made the turbines under the superintendence of the late Mr. Andrew Laing, and others had in him. Tn the obituary notice last week his attempts to make diamonds were described, but it may be put On record that he spent some 30,0001. on these experiments, remarking, “ We have now made a bit of money, and deserve a little fun.” Several of hia activities have been mentioned, but there were also many others, as his interests ranged over the whole sphere of art, science and engineering. He was a splendid mechanic, and was equally good at fine as at heavy work. He was most skilful at making models- of all sorts, largely with bits of cardboard and wood with sealing-wax as a jointing material. Many of these were made to demonstrate some physical fact, and, in the early days, wonderful mechanical toys were made for his children. About 1887, he made a model aeroplane of about 4-ft. span, driven by a steam-engine which had methylated spirit in the boiler; for fuel the exhaust was burnt under the boiler. This made several successful flights, but had invariably to go into the repair shop after alighting. He was also interested in the reproduction and augmentation of sound, and made an air valve, worked from a gramophone or' musical instrument, such as a violin or cello, by which the sound was greatly augmented, and, in some cases, improved in quality. This,' when applied to the gramophone, was known as the Auxetophone, and when played from the terrace of his house at Wylam, was heard all over the village to the great detriment of the attendance at church on a Sunday evening. He also always took a great interest in optical work, largely inherited from his father, the Earl of Rosse, who made the famous 6-ft. telescope at Birr, Ireland. As early as about 1887, he developed a method of producing parabolic searchlight reflectors at a fraction of the cost and weight of the Mangin reflectors then in use. This work was steadily developed until for many years Heaton Works have produced nearly all the searchlight reflectors of parabolic form in this country. He also devised a mirror with one axis a parabola and the other a hyperbola or an ellipse, and also a method of manufacturing these mirrors, so as to give a flat beam for use on the Suez Canal or other similar places, or for projecting the beam through a narrow loophole in a fortress. As a corollary to this, a divided beam could be produced at will by a split mirror, with the two halves hinged so as to give a dark centre and thus avoid dazzling an oncoming ship. In recent years, he took over the optical and telescope works of Sir Howard Grubb, F.R.S., whioh are now at Heaton, under the name of Sir Howard Grubb, Parsons and Company, where telescopes and other optioal instruments of the largest size are being made, one of the products of this firm being actually illustrated and described elsewhere in this issue. He also had a controlling interest in Messrs. Ross, Limited, and, to a large extent saved a great part of the manufacture of optical glass in this country, by taking over the Crown Glass Works at Derby, where he was able to introduce many improvements in the manufacture of optical glass. He was a strong believer in the importance of research and accurate measurement, and from the very beginning accurate testing of the turbines and other manufactures was the practice ; very large sums were continuously spent on research. He believed most strongly in the value of what may be called highly-educated labour, and thus had always on his staff men with the best education possible, but it had to be combined with good practical knowledge. Sir Charles was the most delightful companion socially. Many a pleasant day have I spent at his lovely shooting-box on the Northumberland moors, either wandering over the moors, where we amused ourselves by setting fire to the bracken or fishing on Sweethope Lough. I am not a fisherman, and so the usual procedure was that Sir Charles fished while I rowed the boat, and it was remarkable how he seemed to know just where the trout were. He was also a first-class shot. In the house or club, he was the most delightful of hosts, and many and various were the subjects discussed at such meetings. His is a loss that can never be replaced." THE LATE HON. SIR C. A. PARSONS. To The Editor of Engineering. Sir,—I have read with great interest the admirable memoir of Sir Charles Parsons, which appeared in your last number. In particular, I was gratified to observe that you referred to the fact that my father, the late Sir Robert Ball, had some share in the education of the great engineer. The exploits of Charles, Clere, and Randal Parsons, were often described to me and my brothers, by my father, when we were boys. Amongst other things, they constructed a “ motor ”—I think your article referred to the fact—it was worked by a steam engine, and the boys, greatly to their delight, got it to go in the grounds of Birr Castle. But then occurred a tragedy. When the machine was being backed, there was an accident: a woman was knocked down and injured. Lord Rosse (more patre) at once declared it to be a dangerous toy, looked it up in a shed and refused to allow the boys to play with it any more. My father always declared that this, the first recorded motor accident in history, retarded the development of “ self-propelled ” vehicles by a period of some 20 years. Royal Courts of Justice, February 14, 1931. THE LATE SIR CHARLES PARSONS. 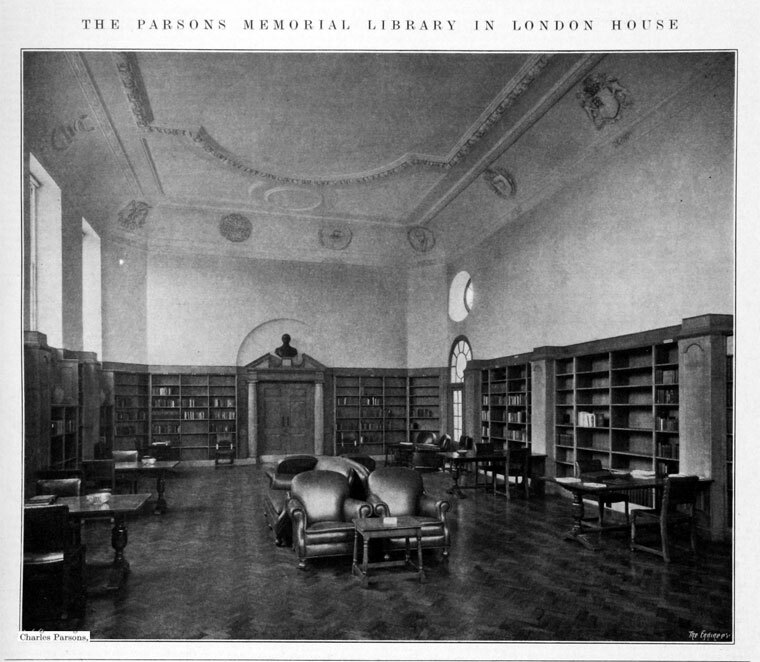 In connection with the article on the late Sir Charles Parsons, which appeared in our issue of the 20th ulto. (page 275 ante), we are asked to make clear the actual facts relating to the transfer of the Parsons patents from Messrs. Clarke, Chapman and Company, Limited, to Sir Charles. We are informed that by the deed of partnership entered into between the Hon. C. A. Parsons (as he then was), and Messrs. Clarke, Chapman and Company, all patents taken out by any partner became the property of the partnership. When Sir Charles Parsons decided, in 1889, to dissolve partnership, the question arose as to the disposition of the patents, and the continuing partners in Messrs. Clarke, Chapman and Company offered immediately to submit the whole matter to arbitration, and to transfer to Sir Charles Parsons the patent rights upon such terms as the arbitrator might award. The arbitration duly took place, but before any award had been made, an agreement was entered into between the parties by which the patents were retained by Messrs. Clarke, Chapman and Company. In 1894, an offer was accepted by Messrs. Clarke, Chapman and Company for the patents and they were assigned to Sir Charles Parsons. Our particular attention is drawn to the fact that Messrs. Clarke, Chapman and Company offered to submit the matter to arbitration from the beginning, and it would appear, therefore, that there was no question of an inordinate figure being demanded. We willingly give publicity to this point in case the wording of the article might he taken to reflect upon the firm’s attitude in the matter, and regret any inconvenience that may have been caused to them." ↑ 'The Steam Turbine: The Rede Lecture, 1911', by Sir Charles A Parsons, K.C.B. ↑ The Engineer 1900/04/27, p 444. 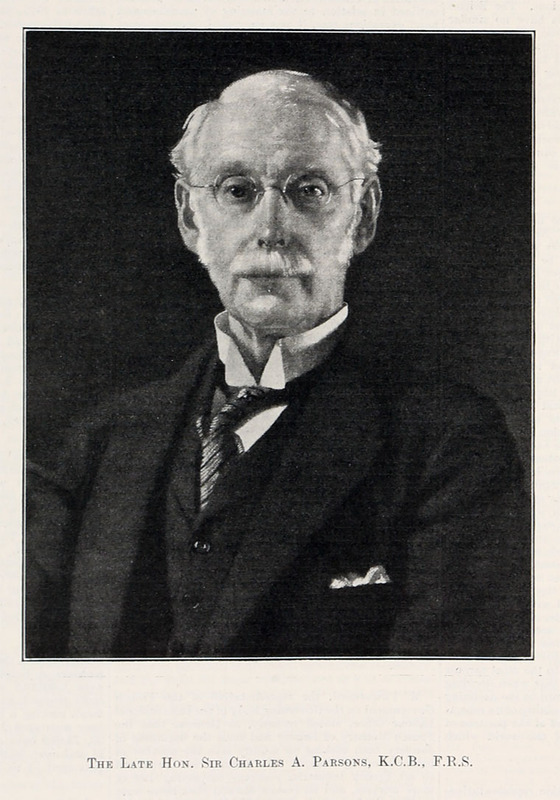 Biography of Sir Charles Algernon Parsons, by Claude Gibb, revised by Anita McConnell, ODNB. This page was last edited on 13 December 2017, at 16:54.